Time to get back up on the blogging wagon! 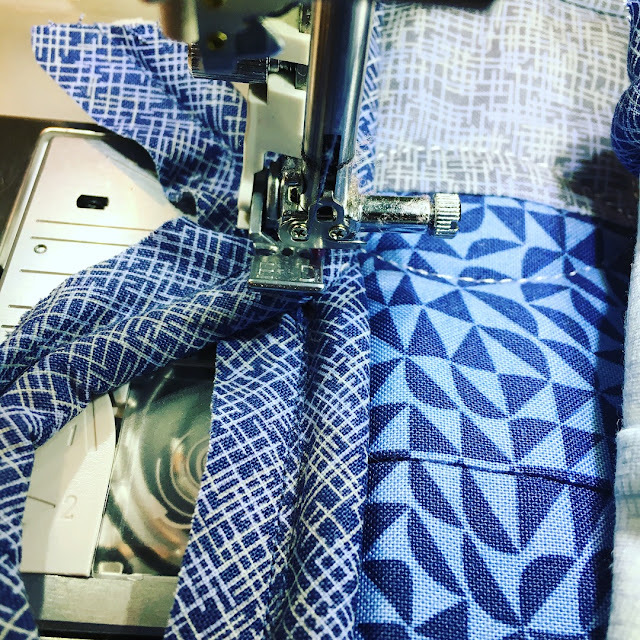 I've been so busy since getting back from the Janome training in late August and them absolutely focused on learning my new machine. 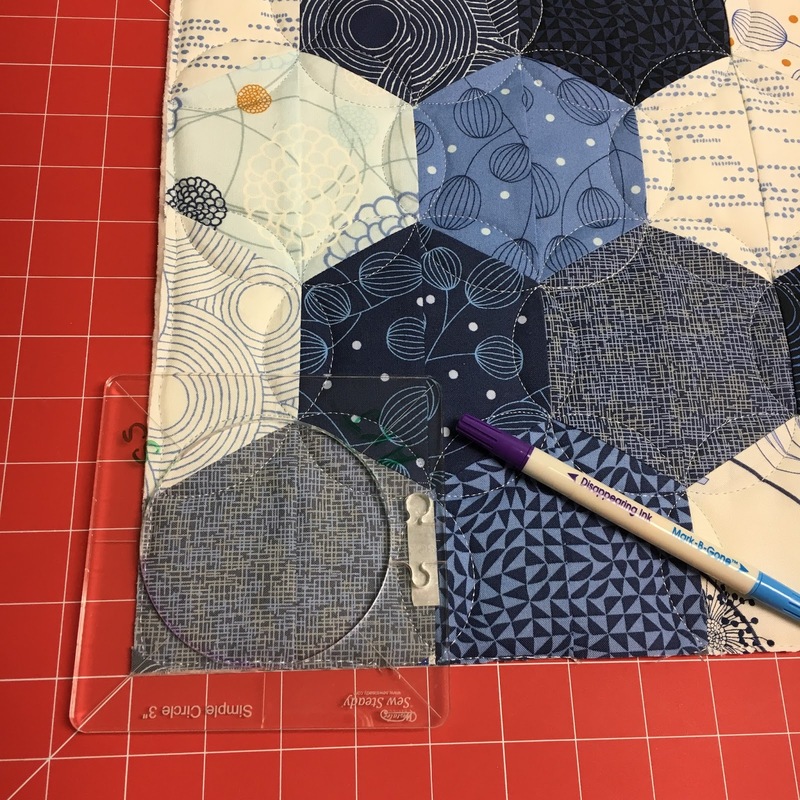 I really didn't think I'd move on from my beloved Janome 8200, but when the newest top-of-the-line Machine from Janome was rolled out with not only a ruler foot, but a ruler work mode....well, I was smitten. As a dealer, I do need to know these machines and I just knew I was going to be on this machine too much to call it a floor model or even a demo model. I have never had such a fancy machine before and frankly, if I had never become a dealer, I don't know that I'd have needed such a machine. 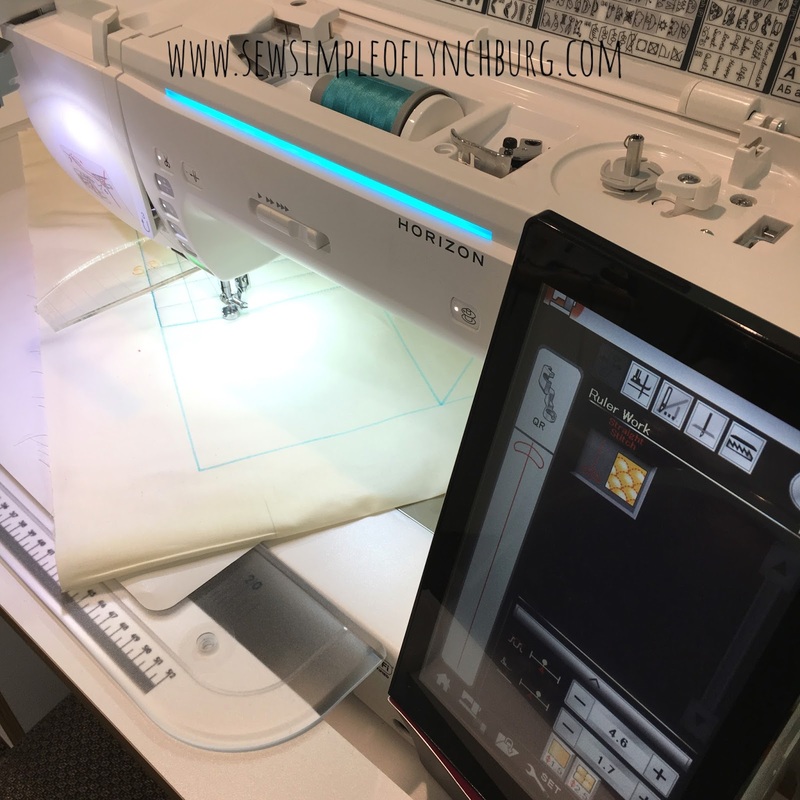 I didn't do machine embroidery before embarking on my Janome dealer journey. (I will say that Janome rolled out another model at the training and had I still been doing my quilting biz at home, the 6700P would have been The One. Total love.) 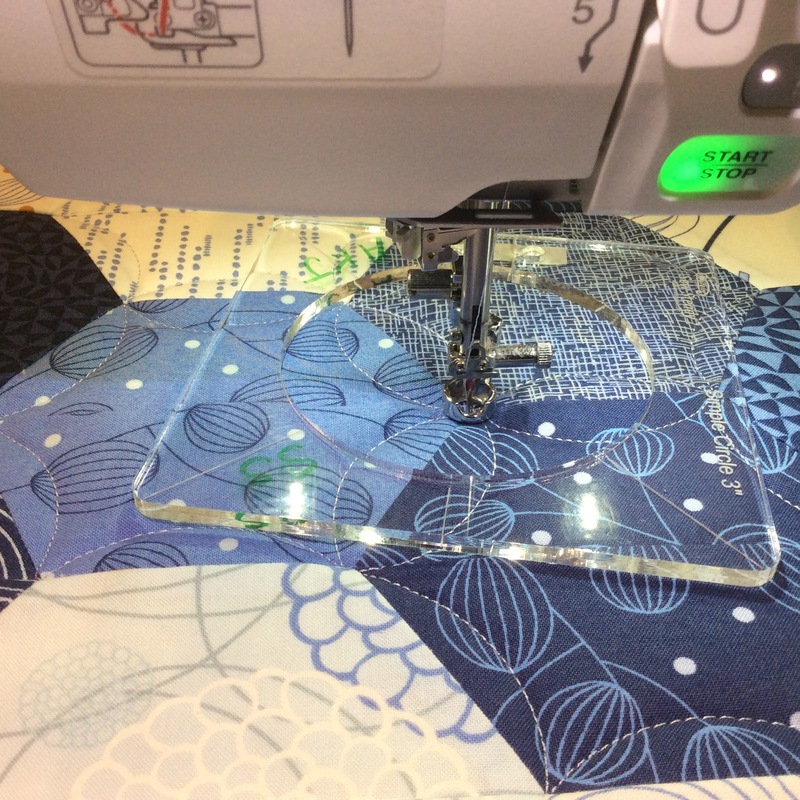 Nevertheless, if you love ruler work, quilting, and embroidery like I now do....this thing is absolutely wonderful! Look at that ruler foot! So smooth, shiny and sleek. It's a standard 1/2 inch diameter foot and since the machine sets the height, there's no need for the shank portion of my good friend, the Convertible FMQ Foot Set. With the automatic presser foot lift feature and the ruler work mode, I don't have to worry about the foot hitting the needle clamp either. If you have an older 15000, Janome has rolled out a free update so you can get this ruler work mode (and have a more reliable needle threader) and some other features, then you can buy the new feet in the very reasonable upgrade kit. 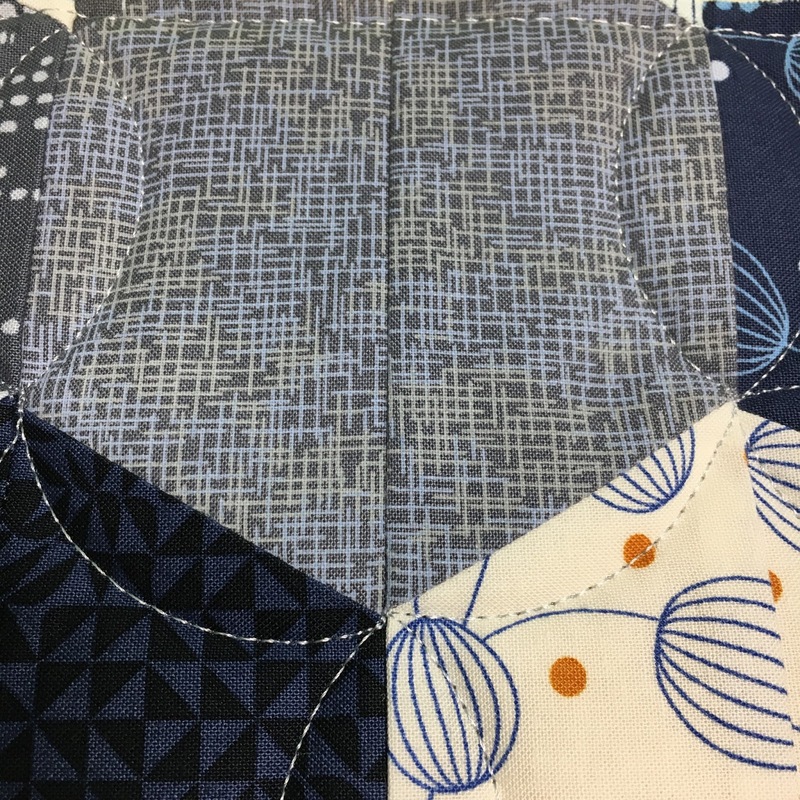 Check with your Janome dealer. 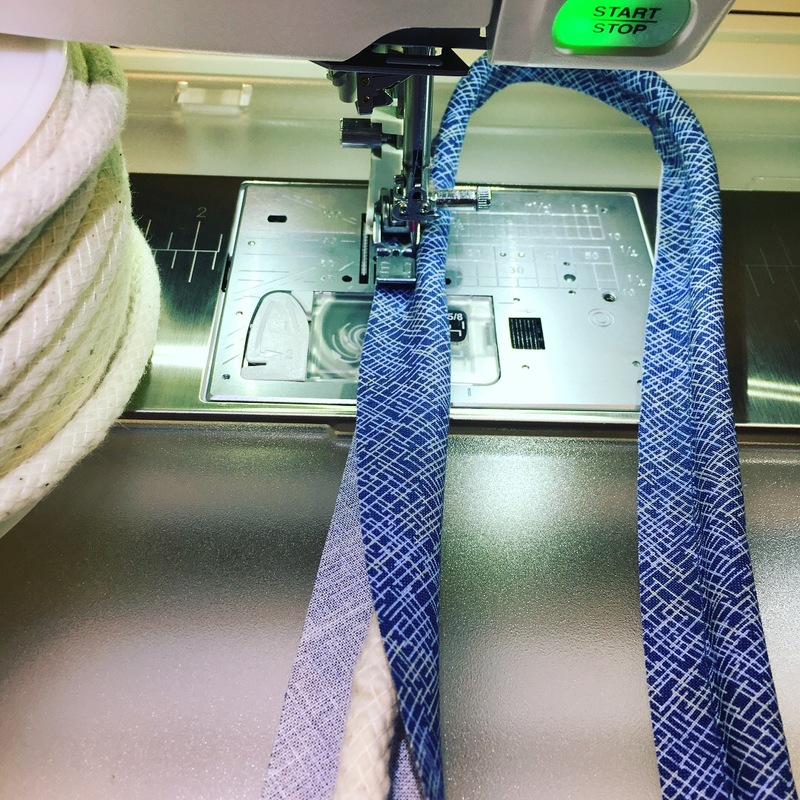 If you have a MC9400, S7, S9, 14000, and possibly the 12000, Janome is working on the software upgrade to allow you to use this foot on your machines as well. I stitched together this hexagon pillow top recently and thought it would be a great first project for my new machine and ruler foot. 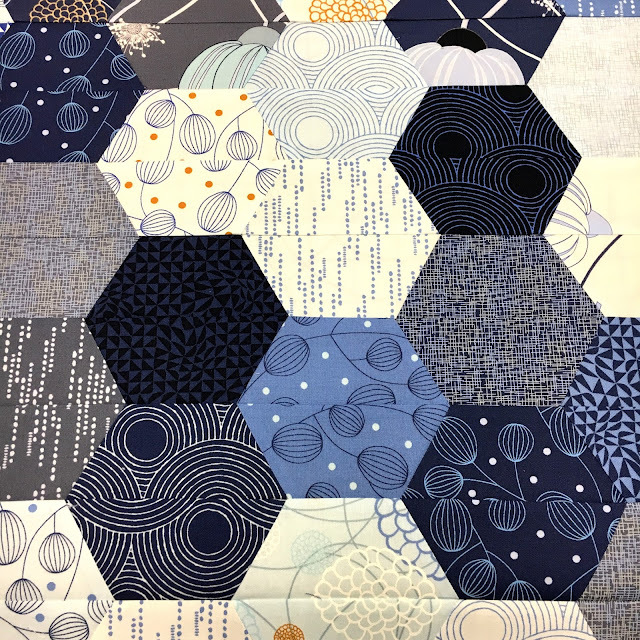 It's Lucky Charm from Jaybird Quilts, using the sidekick ruler and the fabrics are Zen Chic Moda's True Blue (plenty of this at our shop BTW) and I have to say the hexies went together far better than I imagined. Hardest part was keeping the half hexie pairs together. 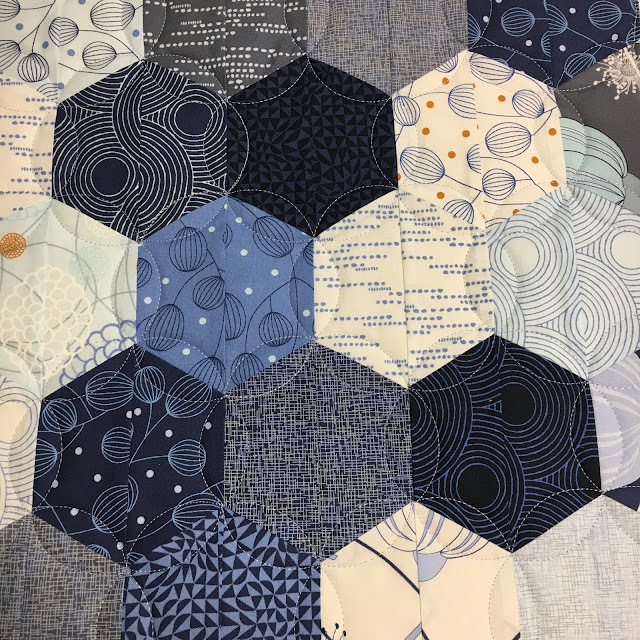 Now, I've got the pattern down pat for keeping this design continuous when working on squares, but the path eluded me on these hexies until I was halfway done. Then it was a little late. I'll do another post on the path soon. Which meant that when taking a picture of the supposed done pillow top, I found a couple of spots that didn't get quilted above. Can you find them above? Take a look below! Whoops! Back under the machine it went. Three more curves and it was done. Then, I just had to try my hand at a pipped or corded pillow edge. First to make the piping. The base I had was too thick for the standard Janome piping foot, so I used the zipper foot for the narrow Acufeed foot. I have all these feet, might as well use them. I used the Acufeed version (a built in walking foot) as I wanted my fabric to wrap evenly around the cording material without slipping. 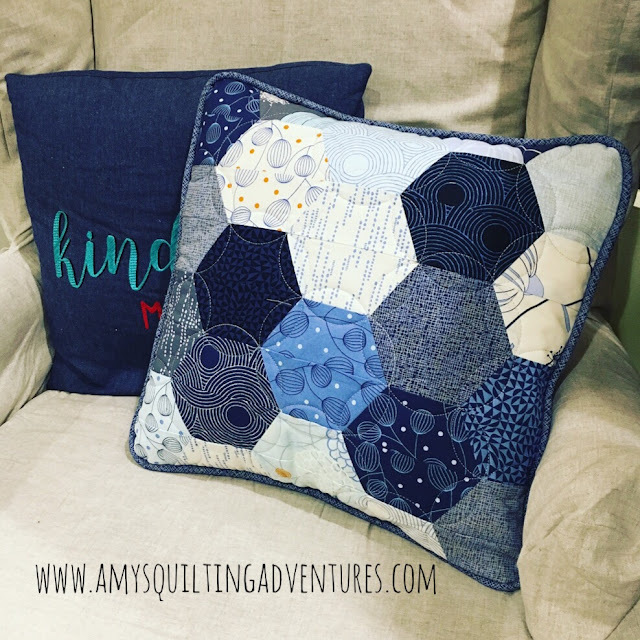 I trimmed up the corners on the pillow top using the same 3 inch circle I quilted it with. These templates are handy for more than stitching, and I use them a lot in design work. 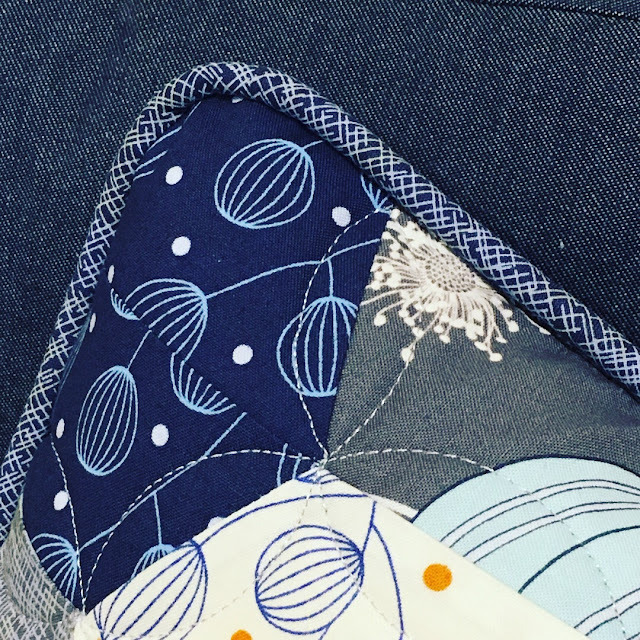 I stitched the piping onto the pillow top with the same Acufeed foot and I sure am glad I did when I hit the spot where I finished by overlapping the cording. Powered right through. Slowly though, so things stayed in position. When it was time to stitch the envelope style back on the pillow, I did go back to the regular zipper foot as I could get closer to the cording with it. I hate cording/piping when it doesn't get stitched on close enough. 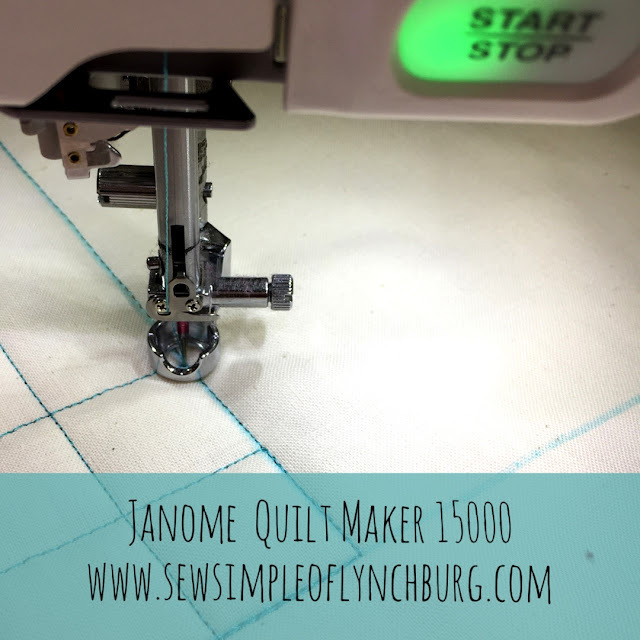 Anybody else here get the new Janome Quilt Maker 15000? I am very excited about this machine and ruler foot. 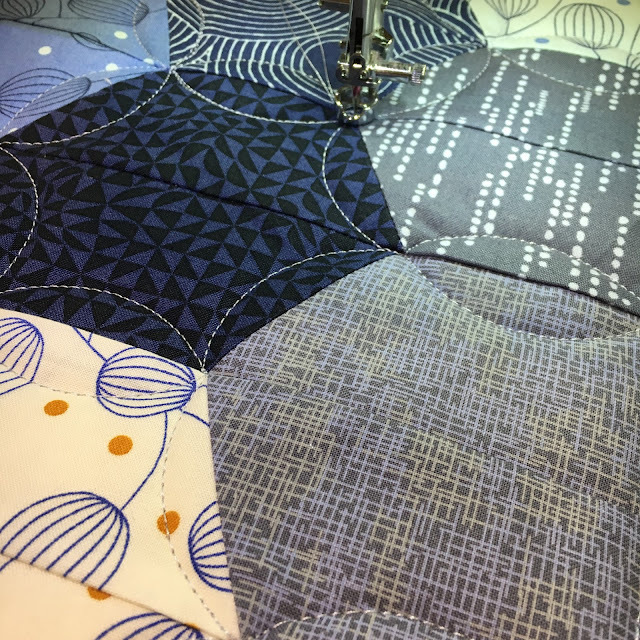 I am so pleased that Janome once again is on the leading edge of my favorite technique. I'm also happy that those of you with machines that will eventually have this new ruler work mode and foot will be able to have "approved" ruler feet for your machines. If you've got questions about this new ruler foot, hit me up in the comments. It doesn't replace the convertible set for most machines, just those with the auto foot lift. Those of you who have been bitten by the embroidery bug, give me one of your favorite tips in the comments. Adorable pillow. Nice instructions. Thanks, Amy!